Total Basement Finishing by Energy Swing Windows provides expert basement finishing services with the patented Total Basement Finishing systems. Our Pennsylvania basement finishing contractors use highly tested and rated materials to ensure your comfort, safety, and overall satisfaction. All of our basement systems mentioned above have a 30+ year guarantee against mold and mildew growth. Our products are also sturdy and easy to clean. If your current basement is dark, humid, and just generally unappealing, we can turn it around. Our total basement finishing package includes such basement systems as mold-free flooring, bright ceiling tiles, insulated walls, moisture-eliminating dehumidifiers, and eco-friendly windows and lighting. We can completely remodel your Pennsylvania basement, or we can focus on one or two problem areas. Simply tell us your goals, and well make them happen! If you want to completely remodel your Pennsylvania home’s basement or you’d like to simply refinish it, we’re the company for you! Our trained Pennsylvania basement contractors have years of experience in remodeling, refinishing, and renovating basements. For years, we’ve proudly served such Pennsylvania towns as Philadelphia, Pittsburgh, Allentown, and Erie. 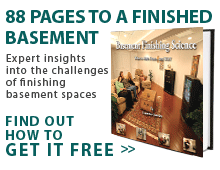 Contact us today to reserve your free basement remodeling consultation and estimate. Don’t wait – spots are filling up quickly – contact us today! "I am a repeat happy customer so why not use you again. I wanted the..."
I am a repeat happy customer so why not use you again. I wanted the patterns I already had with my house to continue on to the enclosed porch. "I would like to thank Eric, Bill,Fred,and Herb. For The amazing two day 13..."
By Frank & Dolly B. By Joe & Laurie K.
"Basement installation as advertised and pleased with the result." "I really liked how everything was explained and how it's all in the same..."
I had flooding and am looking for a better wall system that will prevent water damage. We are doing an exterior french drain and waterproofing. Looking to replace the interior with a product that won't grow mold and mildew if water ever makes it in again. Looking to finish 2 areas in our basement. The first area is roughly 135 sq feet and the other is roughly 215 sq feet. Ceiling height is 8+ feet without interference. Otherwise the remaining basement is already finished. Need to modify my town home basement under 750 sft. Do a brand new single family basement. 1000 sft. We purchased new home with unfinished basement approx 1000 Sq.ft. and our closing date is around Aug 15th/20th. We would like to finish the basement before we move into our new home.Please provide an estimate for below requirements. > Basic finishing. > Powder room. Looking for basement Finishing that will not make the home too expensive to sell. Looking to finish my basement. At the very least i would like to cover the stone walls at the perimeter of the basement. We would like to turn a portion of our basement into a home gym. Wanting to finish basement in stages but with a full quote out to the finished project. We want insulation, framing, walls, electrical, ceiling, 1/2 bath, flooring, exercise area, pool table, wet bar, entertainment area, and wine storage under stairewell. Finished basement (drywall with drop ceiling and recessed lighting and carpet). 200amp upgrade. shower, toilet and sink plumbing and installation, stairs and storage space. Comment: I had flooding and am looking for a better wall system that will prevent water damage. We are doing an exterior french drain and waterproofing. Looking to replace the interior with a product that won't grow mold and mildew if water ever makes it in again. Comment: Looking to finish 2 areas in our basement. The first area is roughly 135 sq feet and the other is roughly 215 sq feet. Ceiling height is 8+ feet without interference. Otherwise the remaining basement is already finished. Comment: Need to modify my town home basement under 750 sft. Do a brand new single family basement. 1000 sft. Comment: We purchased new home with unfinished basement approx 1000 Sq.ft. and our closing date is around Aug 15th/20th. We would like to finish the basement before we move into our new home.Please provide an estimate for below requirements. > Basic finishing. > Powder room. Comment: Looking for basement Finishing that will not make the home too expensive to sell. Comment: Looking to finish my basement. At the very least i would like to cover the stone walls at the perimeter of the basement. Comment: We would like to turn a portion of our basement into a home gym. Comment: Wanting to finish basement in stages but with a full quote out to the finished project. We want insulation, framing, walls, electrical, ceiling, 1/2 bath, flooring, exercise area, pool table, wet bar, entertainment area, and wine storage under stairewell. Comment: Finished basement (drywall with drop ceiling and recessed lighting and carpet). 200amp upgrade. shower, toilet and sink plumbing and installation, stairs and storage space.